PARKLAND, Fla. — The announcement came over the public address system Wednesday at Marjory Stoneman Douglas High School: "Before we start our day, we are going to pause for a moment of silence. The moment of silence will last for 17 seconds for our fallen Eagles." Samantha Fuentes, Samantha Grady, Dylan Kraemer and Aalayah Eastmond were among those standing solemnly for the tribute — four of the more than 3,000 students who returned to class for the first time since a gunman walked into the school and killed 17 people on Feb. 14. They were all in the same class when the gunman fired into their room. Wednesday was the first day they were all together again since it happened. "It's everywhere you go," Fuentes told NBC News. "It haunts you." 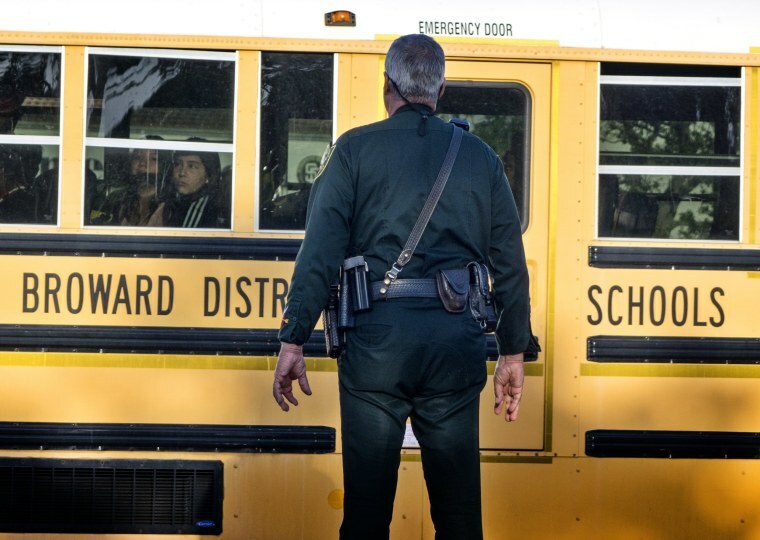 "We all thought he was going to come back," Eastwood said, referring to the gunman, whom authorities have identified as 19-year-old Nikolas Cruz, a former MSD student. "Yeah, we didn't know if he was going to come back or what," Kraemer said. Kraemer shared classes with two of the victims on Feb. 14, Joaquin Oliver and Helena Ramsay. Their absences made the return to school that much more difficult, he said. "Joaquin was in my first period, and his desk was just, like, there and empty, and Helena was in my third period, along with our fourth, and her desk was just — there was no one there," he said. "So it was weird." If the return to class was hard for the students at Stoneman Douglas, it was unbearable for parent Max Schachter. One of his sons, Alex, was killed on Feb. 14. "It's horrible. It's horrible," Schachter said Wednesday. "I walk in his room and he's not there, and I'm crying this morning because I want my little boy back, you know?" Schachter has become a reluctant activist, campaigning for measures to protect children like Alex. On Tuesday, he was at the state Capitol in Tallahassee to lobby legislators to pass stricter gun laws, and he plans to bring in experts to take part in the first meeting of a new school commission next week "to produce a blueprint for school safety." "It boggles my mind," he said. "That's why we have the police. That's why we have the FBI. That's why we have all these federal agencies to protect our children, and now, since everybody's failed me, my only solution, the only thing that I can do, is try to make that classroom a box so that nobody can penetrate it and nobody can hurt other children. "That is my goal, and I will not stop until it's accomplished," he said. Alex Schachter played the trombone and the baritone sax in the marching band, and he wrote poetry. One of his poems is behind the name of the foundation his family created to preserve his memory and to increase awareness of school safety: Life Is Like a Roller Coaster. "It may be too much for you at times, the twists the turns, the upside downs," the poem goes. "But you get back up, you keep chugging along. And eventually, it comes to a stop. You won't know when or how, but you will know that'll be time to get off and start anew." Fuentes is trying to start anew, even as she is still pulling bullet fragments out of her leg. "I wish that I could walk normal," she said. "I wish I could talk and act normal, but I can't. And now I have to create a new normal for myself, and that involves no schools being shot up." Kerry Sanders and Savannah Sellers reported from Parkland. Alex Johnson reported from Los Angeles.